Set in the heart of picturesque Worcestershire countryside, moated grange Birtsmorton Court is a unique and romantic setting for weddings, civil partnerships and receptions. 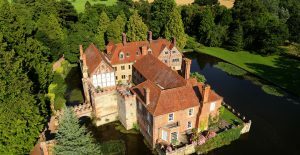 With the original foundations laid in 1241, Birtsmorton Court is steeped in history which is reflected in the original features, moats and idyllic gardens. 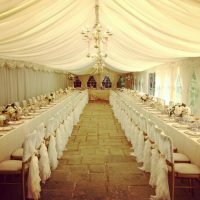 Choose from a variety of stunning settings for your celebrations including the 14th Century Church, Great Hall, Garden Room, Marquee and White Garden. The beautiful 14th Century sits within walking distance of the Court and accommodates up to 115 guests. Beautifully kept the church is an elegant setting for you to declare your commitment to each other. 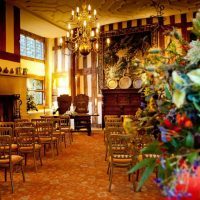 Dating back to the 15th century, the Great Hall is aptly named due to its warm and stately elegance. Wood paneled walls adorned with portraits and tapestries, grand fireplace and elaborately plastered ceiling create a cosy and intimate ambiance. Beautifully adaptable, the Garden room was an Elizabethan bowling alley prior to its refurbishment and accommodates up to 200 guests. Beautiful traditional features the neutral décor making it an ideal setting that is easily customised to suit your vision. Exposed brick walls, vaulted ceiling and traditional wooden beams are brought up to date with a fairy lit canopy and customisable coloured lighting. 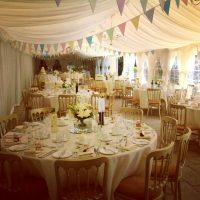 The charming marquee adjoins the garden room providing an extension for extra guests or as a standalone setting during fair weather. Opening onto the maintained lawn, and surrounded by fairy lantern decorated trees it provides a light and airy space for larger celebrations. The bewitching formal gardens make a charming setting for outdoor ceremonies and celebrations. Stroll through the flowered arches, past the cherubic fountain to find the fairy tale pergola with tall stone columns and ironwork cover. Whether you envisage an intimate gathering or grand celebration the White garden offers a versatile space to suit your needs. To simplify planning a wedding Birtsmorton Court offer a range of set packages in addition to the bespoke services. 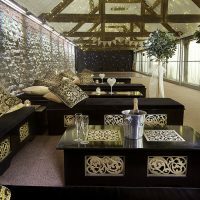 Relax, whilst the dedicated wedding team create the perfect celebration for your memorable day. Alternatively, if you want to oversee all the arrangements and take control the experienced team are happy to assist with tailored and bespoke packages. To fully enjoy your day without the stress of retreating to offsite accommodation, take advantage of the choice of rooms at Birtsmorton Court. The tranquil Bridal Suite, spacious Garden House and Park Lodge cottage offer a range of comfortable rooms for the bridal couple, bridal party and guests.